Moline, Illinois. Where the Mississippi River flows from east to west. It was our hometown. For some of us, it still is our hometown. For some it's the hometown of our youth. For others, it was the town where we graduated high school. But for all of the Class of 1962 there is a connection to Moline, Illinois. 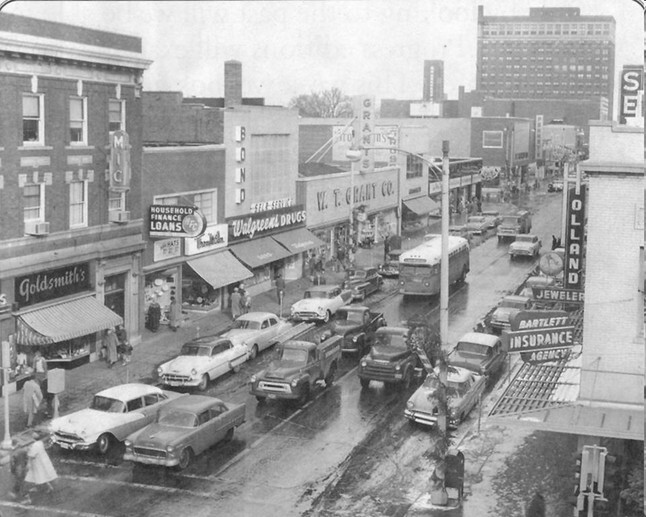 This is how downtown Moline looked when we were high schoolers. Today Moline looks quite a bit different. Time marches on. But, regardless of the passage of time, Moline has done a pretty good job of still looking good ... just like a lot of '62 grads! In the collage below, you'll see a lot of familiar things. Clockwise from the upper left: Butterworth Center, Wiman House, Downtown Moline from Hospital Bluff (the Lutheran and Moline Public Hospitals are no longer there), the Moline-Bettendorf (Memorial) Bridge, Whitey's Ice Cream, Wiman Carriage House, Leclaire Hotel (now a residence center), the Carnegie Library Building. In the center are the clock tower of the downtown First Lutheran Church, the Spanish War Memorial in Velie Park, and a Moline water tower. 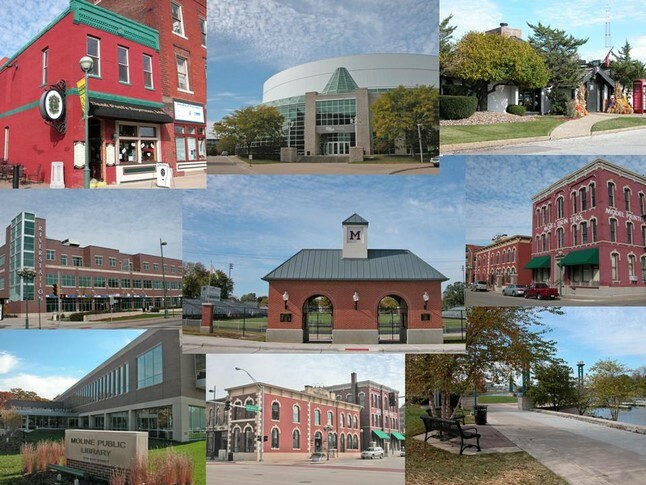 In the next collage you'll see how Moline has combined the old with the new. New construction and renovation of the old combines to make Moline a neat place to visit and live. 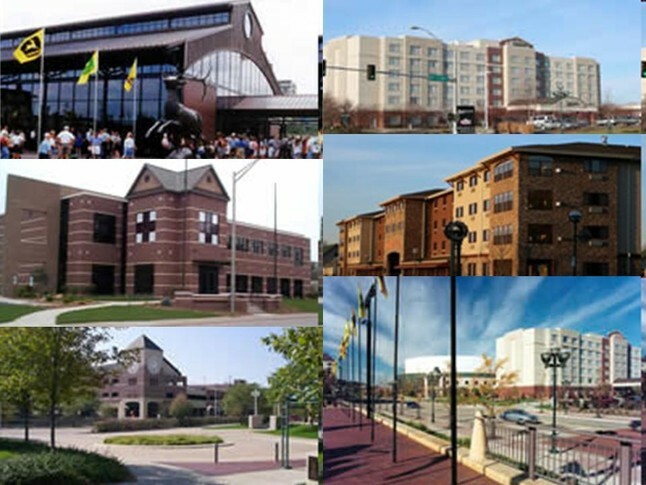 In the collage above, clockwise from upper left: Dead Poet's Expresso in a renovated building near River Drive, the i Wireless Center (originally The Mark), Governors Bar & Grill, Model Printers in the original Moline Library building on 15th Street, the walking and biking path along the Mississippi River (which extends from Rock Island to East Moline), WaterMark Corners in a renovated building on the corner of 15th Street and River Drive, the new Moline Public Library on 41st Street not far from Moline High School, Riverstation on River Drive which houses Bass Street Steakhouse. And in the center is the new entry to MHS's Browning Field. 1. John Deere Pavilion: Deere & Company built this site on River Drive for the many thousands of fans of John Deere equipment. It is visited by thousands of people every year. 2. The Radisson Hotel: along with a TGIFriday's Restaurant, it sits along the banks of the Mississippi River. 3. Stoney Creek Inn: a unique hotel on Bass Street. Bass Street was the original name of Moline's 17th Street. 4. The John Deere Commons: the name of the redeveloped area on River Drive. 5. MetroLINK/Centre Station: bus terminal, parking, and banquet facilities. 6. The Red Cross Quad City Headquarters on River Drive. 1. 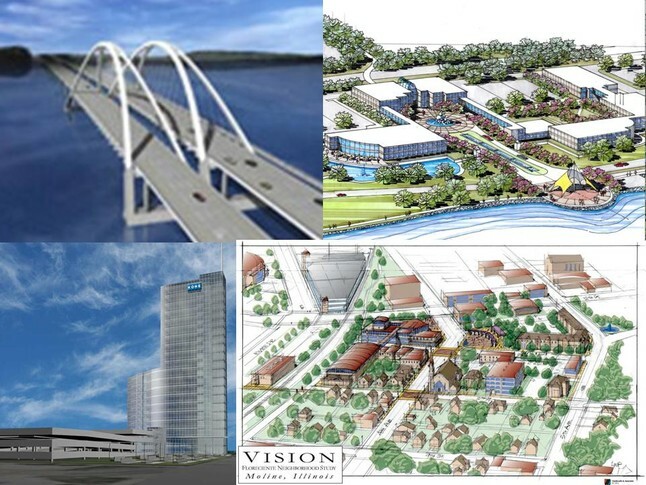 The proposed bridge to replace the Moline to Bettendorf bridge. 2. The proposed Western Illinois University Campus on River Drive north of Riverside Park. 3. The Vision for the redevelopment of the Floreciente Neighborhood, west of downtown Moline. 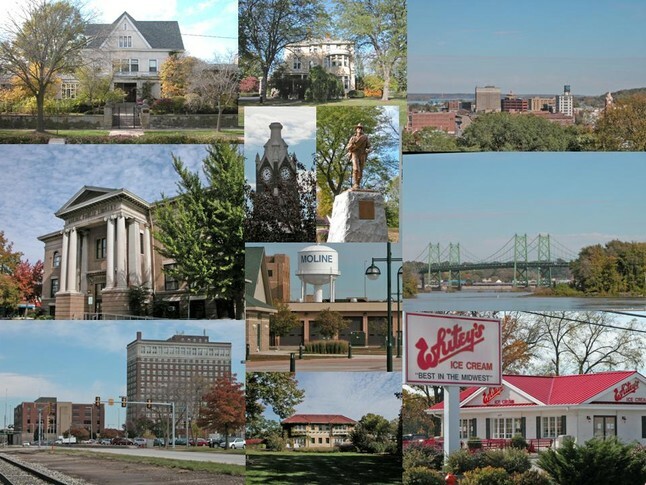 As we find more pictures of interest, we'll add them to this site so you can check back and see what memories of your hometown we have found!